FAIRBORN — A few days prior to this weekend’s Horizon League opening home softball series against Green Bay, snow was being plowed off the field. 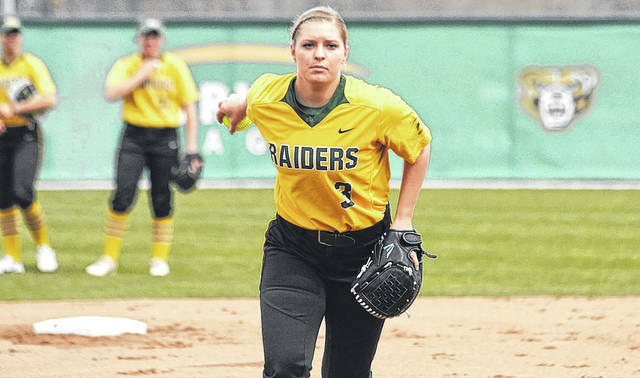 Inclement weather is not likely to faze Wright State University junior pitcher Ally Russell after the comeback she has made. In her freshman season for WSU in 2016, Russell was an ace in the circle with a 10-4 record, including a victory over Big Ten opponent Indiana. It was also around this time that Russell was lifting one day and sustained a herniated disk injury that lingered through her sophomore year. “At the end of my sophomore year, I was in a lot of pain. And my family and I decided that it would probably be best to have surgery to fix it,” Russell said. The surgery was done in June, but instead of a routine recovery there were a few complications Russell dealt with over the next few months. Russell says her family and faith have been a significant part of her getting through the recovery process. She also credited her teammates and WSU coach Laura Matthews. Matthews praised Russell for her resiliency. Russell is an organizational leadership major, and has aspirations to be a future softball coach. “In the fall I couldn’t pitch, so I spent all of my time in the bullpen with the pitchers, talking to them and working on things. I feel more prepared to be a coach,” Russell said. This season, Russell has pitched sparingly as she continues to build her stamina and rehab her leg. In this role, she has wins over Western Michigan and College of Charleston where she went five innings and didn’t allow an earned run in each outing. During her collegiate playing career, Matthews was a catcher for Dayton. Russell feels this is ideal for coaching a player at her position. Russell spoke with plenty of enthusiasm about being back on the field. She is motivated by the idea of returning to her freshman form, which she appears closer to reaching. “Last season was difficult, because I was hurting a lot more than I was my freshman year. I’m getting there slowly, but think about those things and want to get there,” Russell said. Information courtesy of Wright State University www.wsuraiders.com/.